Despite our doubts about returning to the big city after our Cholon Bay respite, we had a fabulous time. Our original plans were to leave on Boxing Day, so we decided to go out with Ralph and Karen for a Christmas Eve dinner and our farewell to our wonderful buddy boat party.We wandered around the Old City which was unusually quiet so early in the evening and on Christmas Eve as well. 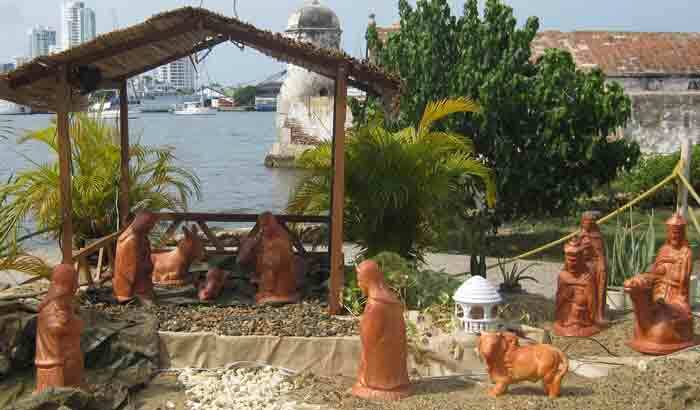 We checked on a couple of restaurants recommended in the Cruisers' Guide to Cartagena. However, they were closed. We eventually stopped at El Bistro again since it was open and we loved it last time. We managed to get the only unreserved table in the room. There was a special Christmas Eve menu and I thoroughly enjoyed my rolled turkey breast, while the others savoured their beef tenderloin. We each chose the salad with baked cheese and also the scrumptious desserts. The entire bill (without drinks) was $15.00 each!!! I would eat there any time! Dave and I had missed the open-air party bus tour of the neighbourhood lights so we set out to explore them on foot. The highlight was at the parque de la marina outside the city walls. The entire park was resplendent with illuminated poinsettias, a gigantic Mary and Joseph and (what we at first thought must be the manger) a toppled over Frosty. Dozens of local families, dressed in their very best were strolling about and playing in the cool of the evening. It finally started to feel like Christmas as it is not the location or climate but the coming together of families and friends that truly creates the spirit of Christmas. On the way back to Club Nautico we discovered a lovely creche with terra cotta figures on the sidewalk in the parkette just outside the marina. We were delighted to find that Baby Jesus had already arrived. The miracle of it all is that in a country known for crime, all of the figures were there intact for all to enjoy. We did not have the camera with us at the time, so we went back today for a photo. Some of the landscape cloth was disturbed by the big slow in the area yesterday, but it was as charming as ever. Christmas dinner was a huge success! 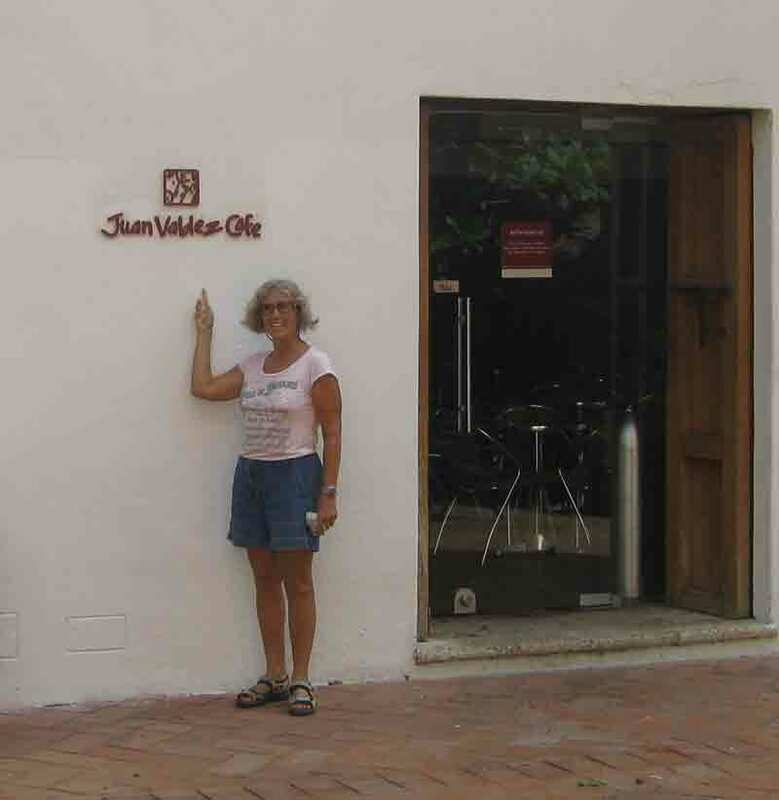 Because Club Nautico has been demolished and could not host the annual dinner, the owner offered to rent us the courtyard of her backpackers' hostel in Getsemani. The organizers, especially CABARET had decorated the area beautifully, with red and white table and chair covers and lovely floral arrangement. 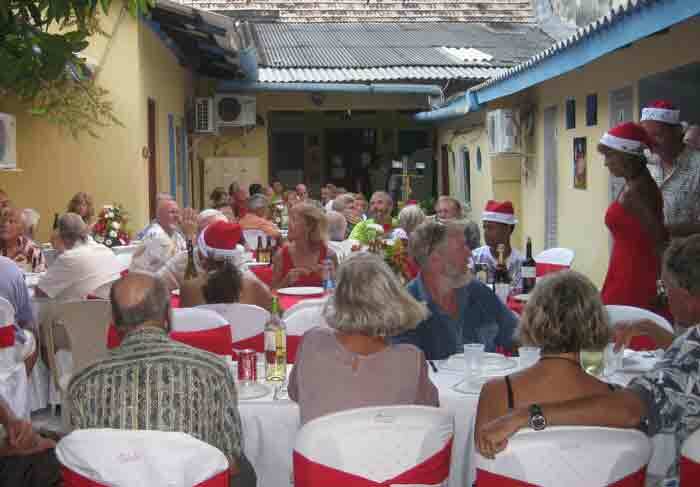 Seventy people gathered under the mango trees and everyone contributed to a delicious meal. After dinner Pam and Bill from SONGBIRD entertained us with some wonderful jazz and Christmas songs. Even the walk back to the marina was appreciated as everyone had overeaten, of course! We didn't get away on Boxing Day as planned because we discovered that our propane tank had leaked and we need to refill it. It will be at least a month before we get to civilization where we can get propane (or probably butane), so this was important. Fortunately, Lorenzo agreed to a run yesterday and Dave seems to have found the leak, so we are good to go. Today we took a last walk about the Old City. 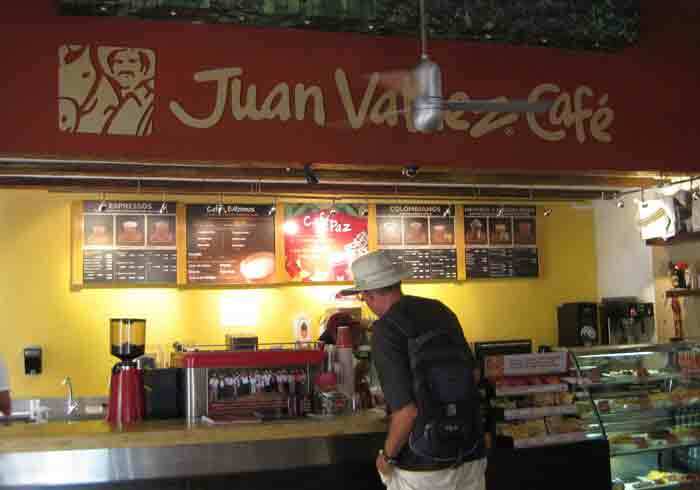 We especially wanted to find the Juan Valdez Cafe. There actually IS a real Juan Valdez. Apparetly he and his family were instrumental in organizing the coffee growers of the region to ensure a quality product and making the best use of marketing to the benefit of all. His family and organization have also contributed to the workers' welfare through public work projects and the building of hospitals and schools. Jonathan, these photos are for you! The boat behind us is very glad we stayed an extra day as they had their new dinghy and motor-in the water but secured by a rope and a chain- stolen two nights ago. Dave has been offering them a ride to shore whenever he is going. Without the dinghy one is basically boat bound. I guess the old mantra of "Lock it or lose it" must now be amended to "lock it, lift it, or lose it"! This will be the last report sent to the blog (with pictures) as we leave in the morning for Cholon Bay and then direct to the desert islands of the San Blas off the east coast of Panama. I will be able to send text messages to the blog site via Sailmail and then resend them later when we have access to the internet, with the pictures added. It was wonderful to call to our family members on Christmas Day. Love to everyone. Have a wonderful New Year!! !